The real story behind sangrita, the traditional red-hued Mexican accompaniment for Tequila, is up for debate. We tackle two competing styles, with recipes. With the renewed rise of cocktail culture, Tequila has come back from a low point in American drinking (the 90s weren’t kind to the spirit’s image). One-hundred percent pure agave bottlings have become the norm and people have discovered the beauty of slowly savoring a glass of quality Tequila. 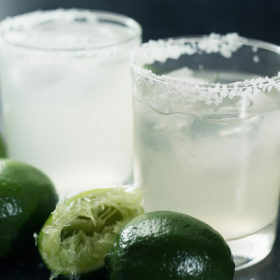 Now it’s time to replace the lime-and-salt-shaker chaser and rediscover Tequila’s original sipping companion, sangrita. Often confused for the popular summertime fruity wine concoction of similar name (sangria), sangrita is a blend of juices and spices native to the Lake Chapala area of Jalisco, Tequila’s homeland, and meant to be sipped alongside the liquor as a palate cleanser. Sangrita, which directly translates to “little blood” in Spanish, takes its name from the chaser’s distinctive red hue. The mistake of adding tomato juice caught on and a distinctly different—but equally delicious—variation on the drink had formed. Like so many other classic cocktails, its origins and history are a bit of a mystery. For most of its history this Tequila companion was little-known outside its home in Jalisco. However, in recent years, outsiders who managed to try it were eager to recreate the spicy, savory drink back home. And this is how sangrita style became split between two camps. Traditional Lake Chapala-style sangrita uses Seville oranges as its base—a sour, tart and slightly bitter variety—usually combined with lime, pomegranate, chili powder and hot sauce. These ingredients come together to impart the signature color that gives the drink its name. However, when non-locals saw the vibrant red concoction, many erroneously assumed it contained tomato juice, and used the ingredient in their own recreations back home. The trend caught on, and as a result, a distinctly different—and equally delicious—variation on the drink formed. This alternate style uses a tomato juice as a base, along with a variety of citrus, savory and spicy flavors. This technique, sometimes called “Mexico City style,” has now become as ubiquitous as the original citrus-based blend. How Do I Make Sangrita? We’ve enlisted two seasoned bar professionals to contribute their very different takes on this classic: Alex Valencia, a native of Jalisco, Mexico, who is bartender and partner at La Contenta in New York City, and Jeff Stockton, a San Diego native and current bar manager at Cast Iron in Atlanta. Click through to check the technique. A native of Jalisco, Mexico, Valencia now helms the bar at La Contenta where he shines a light on mezcal, Tequila, and lesser known Mexican spirits like raicilla and sotol. Valencia’s recipe focuses on simplicity and tartness to refresh the palate after each sip of Tequila. Combine all ingredients and stir. Add salt and pepper to taste. This American riff on sangrita uses a “more is more” approach to ingredients, and decidedly emphasizes the savory to strike balance with the sour. Tomato juice is used in equal proportion to orange juice, and roasted vegetables take center stage. On a grill or in a cast iron pan, roast onion, ancho chili and half the jalapeño for 4–5 minutes, until onions begin to char. Remove from heat and place in a blender. Add remaining ingredients and blend until smooth, and salt to taste. Let sit for 10 minutes. Strain finely before serving.